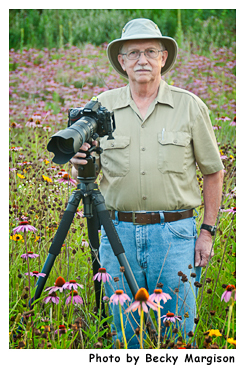 After 32 years in the insurance industry, I retired from Farm Bureau insurance in Indianapolis, Indiana, to pursue writing and outdoor photography. My interest in photography dates back to my early teenage years in the 1950s. I was school photographer for the Shelbyville News my junior and senior years at Morristown High School. For many years thereafter, I did portrait and commercial photography on a part-time basis and photographed hundreds of weddings. I also worked part-time as a freelance photojournalist for the Shelbyville News for several years photographing fires, wrecks, sporting events, and taking feature photos. I was also a stringer for Associated Press during the month of May and photographed nine Indianapolis 500 Mile Races as well as practice and qualification days leading up to the great event. Among my published credits are Sports Illustrated, Hoosier Farmer Magazine, The Indianapolis 500 Yearbook, Birdwatcher's Digest, Shutterbug Magazine and Rural Electric Corporation calendars. My travels as a nature, wildlife, and landscape photographer have taken me across America from Maine to Hawaii, Florida to Alaska and most states in between searching for and capturing special moments and events through the lens of my camera. Last updated or revised on January 26, 2016.